which is followed by an Old Icelandic royal epithet. gold "leader of the war-band"
and (an object for) the herdsman's hate. and the husband of Vardh-rúna (a giantess?). Saturn "ruler of the thing"
whip "king = descendant of good kin"
and the sickness (destroyer) of snakes. trouble "niflungr = descendant of the dead?" ice "one who wears the boar-helm"
and the life-long sorrow (=destroyer) of ice. wheel "descendant of the victorious one"
and Farbauti (= a giant) of the arrow. 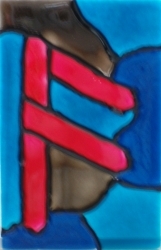 bow, rainbow "descendant of Yngvi"
Faux stained glass originals, available at Analemma´s Glass Art and Triangle Heathens Crafts.